LeEco today (June 28, 2016) garners Rs 78.6 crore by achieving sales orders of over 61,000 units of its next generation Superphones, Le 2 and Le Max2, in its flash sale campaign on both LeMall.com India and Flipkart, updating the industry records set by itself a few months ago. The total registration reached over 6 lakh within 8 days. LeEco is also the first brand which released two flagship phones with Qualcomm processors in the same day. The records were achieved through two combined channels, LeEco's own marketplace e-commerce platform, LeMall.com India, which was just launched on June 8th, and Flipkart. Atul Jain, COO - Smart Electronics, LeEco India, said, "We are humbled to see yet another stupendous Flash Sale record in a row. The entire LeEco family is overwhelmed seeing the response from our users. This time we have introduced world's first Digital Lossless audio standard (CDLA). This will bring an unparalleled audio experience to our superfans thereby ushering in an era of lossless music in India and the globe. This is going to become the new industry standard. We promise to live up to our Superfans' expectation by bringing more breakthrough technologies, stronger comprehensive ecosystem, and disruptive pricing". 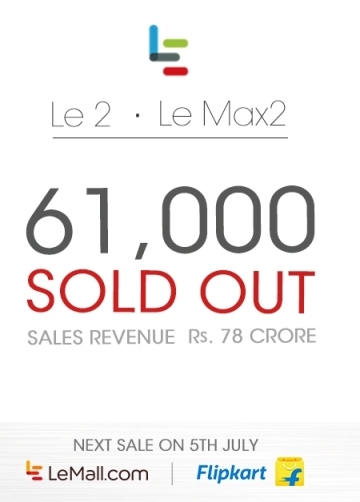 The unprecedented responses from buyers were expected given four compelling reasons LeEco brought to the smartphone market in India: lossless music with CDLA standard, Supertainment with a complete content ecosystem and membership program, stylish design and unprecedented features with cool technologies, and all these three coming at a disruptive price offer by LeEco. The record making numbers of more than 61,000 orders received from buyers only vindicates the point that LeEco's Superphones popularity has been soaring in an unprecedented rate. The total sales number in the flash sale also points to the growing craze for Lossless music. To catalyze this CDLA (Continual Digital Lossless Audio) standard adoption, LeEco has made a handsome investment of Rs 200 million. In the first flash sale of its Superphones Le 2 and Le Max2 that was held today (June 28), the internet technology conglomerate gave away a free CDLA earphone worth Rs. 1990 to all Le 2 and Le Max2 buyers. LeEco is the world's first company that created the type-C CDLA earphone, replacing the traditional 3.5mm headphone port and creating a lossless audio experience to end users. The Supertainment program of LeEco is something that is resistless given the popularity of entertainment programs in India. LeEco is now working with big names like Eros Now, YuppTV and Hungama in India. Through LeEco's Membership program, users can get access to a collection of 2000+ movies, inclusive of premieres from Hollywood & Bollywood. LeEco membership program also provides 3000+ hours of curated shows, 150+ live TV channels and 3.5 million songs of users’ choices. LeEco takes the lead in offering 1.9 million songs with lossless audio, bringing the users’ audio experience to a brand new height. Another reason that makes LeEco Superphone hard to resist is its stylish design and cool features and technology. With stylish unibody metal designs, Le 2 is powered by the Octa-Core Qualcomm Snapdragon 652 chipset, making the phone the first one in India to adopt such high-end and the most powerful Octa-Core CPU, which performs 21% faster than Snapdragon 800 and is also miles ahead of Snapdragon 808. Le 2 provides a 16MP rear camera and 8MP front camera. The image quality is visibly better with vibrant and true-to-life colours. With technologies like PDAF, Closed Loop and other ground-breaking technologies, people can catch clear pictures in moving and unfavourable conditions. Powered by the world's most powerful processor, Qualcomm Snapdragon 820, Le Max2 features the high performance combination of 6GB RAM and 64GB ROM, pushing the limits of the industry to new heights. With a RAM three times that of the iPhone 6s Plus, Le Max2 gives 40% faster performance than most other models. Le Max2 features a 5.7 inch screen in 2K Super Retina Display, the best display for itself and for VR equipment. Its 21MP rear camera and 8MP front camera both come with the blazingly fast PDAF standard and F 2.0 aperture, which protects the images from smear and dim light. The cameras on Le Max2 shot pictures with great clarity thanks to improved components or technologies like 6-layer of lens, PDAF, Closed Loop, optical image stabilization, Dual HDR and Dual-tone flash and so on. Le 2, the 3GB RAM and 32GB ROM combination Superphone, comes at a compelling price of Rs 11,999. Le Max2, the 4GB+32GB model is priced at a disruptive price of Rs 22,999, and for the high-end 6GB RAM and 64 GB ROM combination the price is at an irresistible Rs 29,999. For people who missed June 28th flash sale, they can expect the upcoming opportunity very soon. LeEco's 2nd flash sale for Le 2 and Le Max2 will start on July 5th, and the registration commence from 4pm today (June 28). LeEco, formerly known as Letv, is a global pioneering internet and technology company with multiple internet ecosystems across content, devices, applications and platforms. Founded in November 2004 by Jia Yueting and Liu Hong, LeEco employs more than 10,000 people and is the world’s first video company to go public with a market capitalization of more than $12 billion USD. Headquartered in Beijing, China, it has regional headquarters in Hong Kong, Los Angeles and Silicon Valley. With “Complete Ecosystem, Groundbreaking technologies, and Disruptive Pricing” as the guiding principle, LeEco is engaged in a myriad of businesses, spanning from Internet-based Super TV and Superphones, video production and distribution, smart devices/accessories and large-screen applications, to e-commerce and even connected super-electric cars. 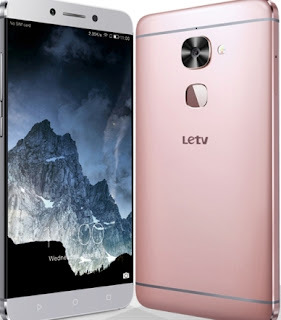 The company also features one of the world's largest content libraries, comprising of movies, TV dramas, entertainment shows, sports and music, which can be conveniently viewed on LeEco products, including the Superphones, Super TVs, and in the near future, Le Autos. Breaking the barriers of industries, LeEco provides personalized products and services for an enhanced user experience at disruptive prices.